Tsunami – Lady Gaga’s hair will quickly be mobilized to create a seawall rendering the oncoming wave completely enamored with her quirky sensibility. Though the wave will later be caught up in a stalking drama. Only after Lady Gaga and the wave have a stern conversation about what makes the wave unique will the wave leave her be and cruise on over to the third world. That’s how America keeps the export our problems to the third world business strong. Earthquake – Although most believe a 10.0 is eventually how LA will fall into the ocean, the city has a secret weapon. Action stars, Sylvester Stallone, Vin Diesel, and Steven Seagal have coordinated a dance routine which involves jumping the opposite direction of the earthquake thus quelling the churning Earth. 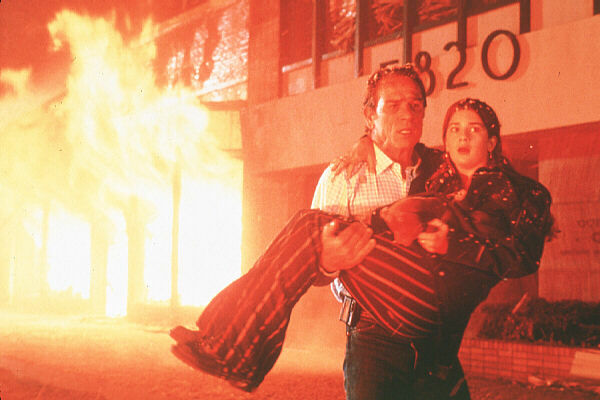 Volcano – While Tommy Lee Jones has already figured this one out years ago, he is getting up there in years. City officials will probably just toss the entire cast of Twilight into the boiling caldera to appease the fire gods. If that doesn’t work, there are a couple of boy bands that might do the trick. Trust me, there are many options for volcanic sacrifices. Expect humor writers… lava deities don’t like them… too salty. Ummm… Tommy? Why are we heading toward the caldera? Tornado – Despite being far from tornado country, Bill Paxton will know what to do. Why? Bill Paxton always knows what to do. That’s just what he does. Takes care of business. Do people thank him? Nope, but he keeps going anyway. He is after all, Bill Paxton. Hurricane/Typhoon – All the money flowing in from the Dodgers would normally stifle the energy of the storm rendering it a gentle breeze. After the 2011 bankruptcy of the team, the state had to contract the hurricane protection to illegal immigrants. No, they aren’t throwing illegal immigrants at the hurricane, sicko. They are replacing the Dodgers with illegal immigrants as a cost saving measure. Alien Invasion – In-N-Out Burger.